CARMEL, Calif. – April 28, 2013 – It was a back-to-back double at the 28th Big Sur International Marathon as 2012 champions Adam Roach (Pacific Grove, CA) and Nuta Olaru (Longmont, CO) defended their titles on Sunday, April 28, along the scenic California coastline. Roach, 29, who trailed in third place until mile 24, kept grinding away until he captured the lead from eventual third place finisher Josh Whitehead of Alabama. His overall finish time was 2 hours, 27 minutes, 46 seconds. Runner-up Matthew Laye (Sausalito, CA) also made a surge in the second half. After mile 10 when he was as far back as seventh place he began picking runners off, and at times pulled to within 15 seconds of Roach. Laye, whose marathon PR is 2:27, finished at 2:28:42 as a debut Big Sur competitor. Third place finisher, Whitehead, was also a first timer at Big Sur. Though he held a commanding lead throughout most of the race, he eventually finished third at 2:28:54. Fourth place was ultra runner Michael Wardian of Arlington, VA (2:31:54) and local runner Brian Dumm of Pacific Grove (2:33:25) finished fifth. Italy’s Hermann Achmuller, 42, placed sixth and first Master (40 and older), clocking 2:34:52. Competition in the women’s race didn’t carry quite as much drama as the men’s contest. Last year’s Big Sur winner Olaru (left, BSIM), 42, pulled away from runner up Heather Utrata of Englewood, CA at the base of the infamous Hurricane Point two-mile ascent. Olaru finished at 2:50:02, only six seconds behind her 2012 victory at Big Sur. Utrata finished second at 2:54:42, followed by Sarah Hallas of Petaluma, CA (2:59:16), Michelle Clark of Toronto, Canada (3:05:31) and Colorado’s Melissa Rickman (3:07:31). 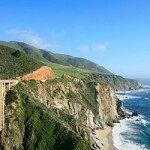 The iconic features of the Big Sur Marathon course which include Hurricane Point, the Bixby Bridge, the tuxedo-clad musician playing a grand piano, and the miles of spectacular views of the ragged Pacific Ocean coastline were all present under swirls of fog mixed with pockets of sunshine. Six varying distance races take place along the scenic course, with all finishers crossing the same finish line just south of Carmel-by-the-Sea, a well-known tourist destination on the Monterey Peninsula. Events included the 21, 10.6 and 9-Milers, a 5K and a marathon relay. Though not competitive races with awards, Steve Cryan of El Segundo, CA finished the 21-Miler in 2:04:44, San Francisco’s Stephen Rothwell took first at the 10.6-Miler in 1:09:16. Awards were given in the 9-Miler where Carson Blackwelder (Boiling Springs, SC) won first place male in 51:03 and Katharin Taylor (Pacific Grove, CA) won first place female at 54:41. The 5K first place finishers were captured by Garry Gellin (16:40) and Brittany Morreale of Albuquerque, NM (18:58). The full marathon also included two sub-categories: the Boston2Big Sur Challenge and the Runner’s World Challenge. Four hundred runners signed up to compete in B2B, a prestigious competition for runners able to complete two challenging races either six or 13 days apart (13 days this year). Winners are chosen from combined times of both races. Hermann Achmuller also took this division with a combined time of 5:02:45, while Michelle Clark won the women’s category with 6:03:09. Olaru, who also competed in Boston, was not officially registered for B2B though her two times would have made her the overall female B2Ber. Three hundred runners signed on for the Runner’s World Challenge, a VIP experience of hospitality, training and relationships with Runner’s World editorial staff. 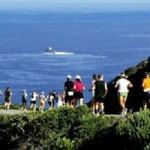 The Big Sur Marathon is executed by a small staff and a large board of volunteer directors. An additional 2,500 volunteers work together to ensure the race runs flawlessly. This year, in the wake of the Boston tragedy, security and safety measures were increased. Registration for the 2014 Big Sur International Marathon opens July 15 at 7:00am PDT. 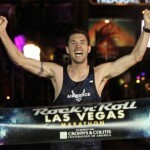 The 2013 marathon distance sold out in 26.2 hours.